For other uses, see Oklahoma City (disambiguation). Oklahoma City (/oʊkləˌhoʊmə -/), often shortened to OKC, is the capital and largest city of the U.S. state of Oklahoma. The county seat of Oklahoma County, the city ranks 27th among United States cities in population. The population grew following the 2010 Census, with the population estimated to have increased to 643,648 as of July 2017. As of 2018, the Oklahoma City metropolitan area had a population of 1,396,445, and the Oklahoma City-Shawnee Combined Statistical Area had a population of 1,469,124 residents, making it Oklahoma's largest metropolitan area. Since 2008, Oklahoma City has been home to the National Basketball Association (NBA)'s Oklahoma City Thunder, who play their home basketball games at the Chesapeake Energy Arena. 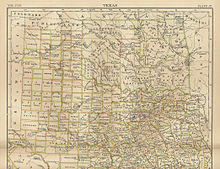 Map of Indian Territory (Oklahoma) 1889, showing Oklahoma as a train stop on a railroad line. Britannica 9th ed. Oklahoma City was settled on April 22, 1889, when the area known as the "Unassigned Lands" was opened for settlement in an event known as "The Land Run". Some 10,000 homesteaders settled the area that would become the capital of Oklahoma. The town grew quickly; the population doubled between 1890 and 1900. Early leaders of the development of the city included Anton Classen, John Shartel, Henry Overholser and James W. Maney. By the time Oklahoma was admitted to the Union in 1907, Oklahoma City had surpassed Guthrie, the territorial capital, as the new state's population center and commercial hub. Soon after, the capital was moved from Guthrie to Oklahoma City. Oklahoma City was a major stop on Route 66 during the early part of the 20th century; it was prominently mentioned in Bobby Troup's 1946 jazz song "(Get Your Kicks on) Route 66" made famous by artist Nat King Cole. Before World War II, Oklahoma City developed major stockyards, attracting jobs and revenue formerly in Chicago and Omaha, Nebraska. With the 1928 discovery of oil within the city limits (including under the State Capitol), Oklahoma City became a major center of oil production. Post-war growth accompanied the construction of the Interstate Highway System, which made Oklahoma City a major interchange as the convergence of I-35, I-40, and I-44. It was also aided by federal development of Tinker Air Force Base. In 1950, the Census Bureau reported city's population as 8.6% black and 90.7% white. Patience Latting was elected Mayor of Oklahoma City in 1971, becoming the city's first female mayor. Latting was also the first woman to serve as mayor of a U.S. city with over 350,000 residents. Like many other American cities, center city population declined in the 1970s and 1980s as families followed newly constructed highways to move to newer housing in nearby suburbs. Urban renewal projects in the 1970s, including the Pei Plan, removed older structures but failed to spark much new development, leaving the city dotted with vacant lots used for parking. A notable exception was the city's construction of the Myriad Gardens and Crystal Bridge, a botanical garden and modernistic conservatory in the heart of downtown. Architecturally significant historic buildings lost to clearances were the Criterion Theater, the Baum Building, the Hales Building, and the Biltmore Hotel. In 1993, the city passed a massive redevelopment package known as the Metropolitan Area Projects (MAPS), intended to rebuild the city's core with civic projects to establish more activities and life to downtown. 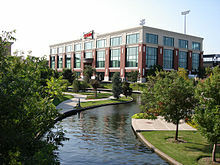 The city added a new baseball park; central library; renovations to the civic center, convention center and fairgrounds; and a water canal in the Bricktown entertainment district. Water taxis transport passengers within the district, adding color and activity along the canal. MAPS has become one of the most successful public-private partnerships undertaken in the U.S., exceeding $3 billion in private investment as of 2010. As a result of MAPS, the population living in downtown housing has exponentially increased, together with demand for additional residential and retail amenities, such as grocery, services, and shops. Residents of Oklahoma City suffered substantial losses on April 19, 1995 when Timothy McVeigh detonated a bomb in front of the Murrah building. The building was destroyed (the remnants of which had to be imploded in a controlled demolition later that year), more than 100 nearby buildings suffered severe damage, and 168 people were killed. The site has been commemorated as the Oklahoma City National Memorial and Museum. Since its opening in 2000, over three million people have visited. Every year on April 19, survivors, families and friends return to the memorial to read the names of each person lost. On June 11, 2001, McVeigh was executed by lethal injection. Oklahoma City lies along one of the primary corridors into Texas and Mexico, and is a three-hour drive from the Dallas-Fort Worth metroplex. The city is in the Frontier Country region in the center of the state, making it an ideal location for state government. 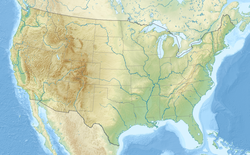 According to the United States Census Bureau, the city has a total area of 620.34 square miles (1,606.7 km2), of which 601.11 square miles (1,556.9 km2) is land and 19.23 square miles (49.8 km2) is water. Oklahoma City lies in the Sandstone Hills region of Oklahoma, known for hills of 250 to 400 feet (120 m) and two species of oak: blackjack oak (Quercus marilandica) and post oak (Q. stellata). The northeastern part of the city and its eastern suburbs fall into an ecological region known as the Cross Timbers. The city is roughly bisected by the North Canadian River (recently renamed the Oklahoma River inside city limits). 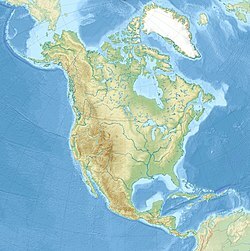 The North Canadian once had sufficient flow to flood every year, wreaking destruction on surrounding areas, including the central business district and the original Oklahoma City Zoo. In the 1940s, a dam was built on the river to manage the flood control and reduced its level. In the 1990s, as part of the citywide revitalization project known as MAPS, the city built a series of low-water dams, returning water to the portion of the river flowing near downtown. The city has three large lakes: Lake Hefner and Lake Overholser, in the northwestern quarter of the city; and the largest, Lake Stanley Draper, in the city's sparsely populated far southeast portion. 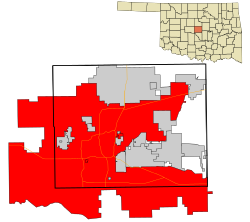 The population density normally reported for Oklahoma City using the area of its city limits can be misleading. Its urbanized zone covers roughly 244 sq mi (630 km2) resulting in a density of 2,500 per square mile (2013 est), compared with larger rural watershed areas incorporated by the city, which cover the remaining 377 sq mi (980 km2) of the city limits. Oklahoma City neighborhoods are extremely varied; pin-neat affluent historic neighborhoods sit next to districts that have not wholly recovered from economic and social decline of the 1970s and 1980s. The city is bisected geographically and culturally by the North Canadian River, which basically divides North Oklahoma City and South Oklahoma City.The north side is characterized by very diverse and fashionable urban neighborhoods near the city center and sprawling suburbs further north. South Oklahoma City is generally more blue collar working class and significantly more industrial, having grown up around the Stockyards and meat packing plants at the turn of the century, and is the center of the city's rapidly growing Latino community. Downtown Oklahoma City, which has 7,600 residents, is seeing an influx of new private investment and large scale public works projects, which have helped to resuscitate a central business district left almost deserted by the Oil Bust of the early 1980s. The centerpiece of downtown is the newly renovated Crystal Bridge and Myriad Botanical Gardens, one of the few elements of the Pei Plan to be completed. In 2021 a massive new central park will link the gardens near the CBD and the new convention center to be built just south of it to the North Canadian River, as part of a massive works project known as "Core to Shore"; the new park is part of MAPS3, a collection of civic projects funded by a one-cent temporary (seven-year) sales tax increase. Oklahoma City has a humid subtropical climate (Köppen: Cfa), featuring hot, humid summers, and cool winters with occasional snowfall. Prolonged and severe droughts (sometimes leading to wildfires in the vicinity), as well as very heavy rainfall leading to flash flooding and flooding, occur with some regularity. Consistent winds, usually from the south or south-southeast during the summer, help temper the hotter weather. Consistent northerly winds during the winter can intensify cold periods. Severe ice storms and snowstorms happen sporadically during the winter. The average temperature is 61.4 °F (16.3 °C), with the monthly daily average ranging from 39.2 °F (4.0 °C) in January to 83.0 °F (28.3 °C) in July. Extremes range from −17 °F (−27 °C) on February 12, 1899 to 113 °F (45 °C) on August 11, 1936 and August 3, 2012; the last sub-zero (°F) reading was −3 °F (−19 °C) on January 7, 2017. Temperatures reach 100 °F (38 °C) on 10.4 days of the year, 90 °F (32 °C) on nearly 70 days, and fail to rise above freezing on 8.3 days. The city receives about 35.9 inches (91.2 cm) of precipitation annually, of which 8.6 inches (21.8 cm) is snow. The report "Regional Climate Trends and Scenarios for the U.S. National Climate Assessment" (NCA) from 2013 by NOAA, projects that parts of the Great Plains region can expect up to 30% (high emissions scenario based on CMIP3 and NARCCAP models) increase in extreme precipitation days by mid-century. This definition is based on days receiving more than one inch of rainfall. Oklahoma City has a very active severe weather season from March through June, especially during April and May. Being in the center of what is colloquially referred to as Tornado Alley, it is prone to especially frequent and severe tornadoes, as well as very severe hailstorms and occasional derechoes. Tornadoes have occurred in every month of the year and a secondary smaller peak also occurs during autumn, especially October. The Oklahoma City metropolitan area is one of the most tornado-prone major cities in the world, with about 150 tornadoes striking within the city limits since 1890. Since the time weather records have been kept, Oklahoma City has been struck by thirteen violent tornadoes, eleven F/EF4s and two F/EF5s. On May 3, 1999, parts of Oklahoma City and surrounding communities were impacted by a tornado. It was the last U.S. tornado to be given a rating of F5 on the Fujita scale before the Enhanced Fujita scale replaced it in 2007. While the tornado was in the vicinity of Bridge Creek to the southwest, wind speeds of 318 mph (510 km/h) were estimated by a mobile Doppler radar, the highest wind speeds ever recorded on Earth. A second top-of-the-scale tornado occurred on May 20, 2013; South Oklahoma City, along with Newcastle and Moore, was hit by an EF5 tornado. The tornado was 0.5 to 1.3 miles (0.80 to 2.09 km) wide and killed 23 people. On May 31, less than two weeks after the May 20 event, another outbreak affected the Oklahoma City area. Within Oklahoma City, the system spawned an EF1 and an EF0 tornado, and in El Reno to the west, an EF3 tornado occurred. This lattermost tornado, which was heading in the direction of Oklahoma City before it dissipated, had a width of 2.6 miles (4.2 km), making it the widest tornado ever recorded. Additionally, winds of >295 mph (475 km/h) were measured, one of the two highest wind records for a tornado. With 19.48 inches (495 mm) of rainfall, May 2015 was by far Oklahoma City's record-wettest month since record-keeping began in 1890. Across Oklahoma and Texas generally, there was a record flooding in the latter part of the month. Of Oklahoma City's 579,999 people, 44,541 reside in Canadian County, 63,723 reside in Cleveland County, 471,671 reside in Oklahoma County, and 64 reside in Pottawatomie County. The median income for a household in the city was $48,557 and the median income for a family was $62,527. The per capita income for the city was $26,208. 17.1% of the population and 12.4% of families were below the poverty line. Out of the total population, 23.0% of those under the age of 18 and 9.2% of those 65 and older were living below the poverty line. In the 2000 Census, Oklahoma City's age composition was 25.5% under the age of 18, 10.7% from 18 to 24, 30.8% from 25 to 44, 21.5% from 45 to 64, and 11.5% who were 65 years of age or older. The median age was 34 years. For every 100 females, there were 95.6 males. For every 100 females age 18 and over, there were 92.7 males. Oklahoma City has experienced significant population increases since the late 1990s. Since the official Census in 2000, Oklahoma City has grown 25 percent (a 125,214 raw increase) according to the Bureau estimates. The 2016 estimate of 638,367 is the largest population Oklahoma City has ever recorded. It is the first city in the state to record a population greater than 600,000 residents. It is also the first city in the Great Plains region to record a population greater than 600,000 residents. It is the largest municipal population of the Great Plains region (Oklahoma, Kansas, Nebraska, South Dakota, North Dakota). Oklahoma City is the principal city of the eight-county Oklahoma City Metropolitan Statistical Area in Central Oklahoma and is the state's largest urbanized area. As of 2015, the metropolitan area was the 41st largest in the nation based on population. Law enforcement claims Oklahoma City has traditionally been the territory of the notorious Juárez Cartel, but the Sinaloa Cartel has been reported as trying to establish a foothold in Oklahoma City. There are many rival gangs in Oklahoma City, one whose headquarters has been established in the city, the Southside Locos, traditionally known as Sureños. Oklahoma City also has its share of violent crimes, particularly in the 1970s. The worst of which occurred in 1978, when six employees of a Sirloin Stockade restaurant on the city's south side were murdered execution-style in the restaurant's freezer. An intensive investigation followed, and the three individuals involved, who also killed three others in Purcell, Oklahoma, were identified. One, Harold Stafford, died in a motorcycle accident in Tulsa not long after the restaurant murders. Another, Verna Stafford, was sentenced to life without parole after being granted a new trial after she had been sentenced to death. Roger Dale Stafford, considered the mastermind of the murder spree, was executed by lethal injection at the Oklahoma State Penitentiary in 1995. The Oklahoma City Police Department has a uniformed force of 1,169 officers and 300+ civilian employees. The department has a central police station and five substations covering 2,500 police reporting districts that average 1/4 square mile in size. 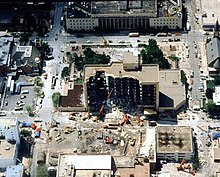 On April 19, 1995, the Alfred P. Murrah Federal Building was destroyed by a fertilizer bomb manufactured and detonated by Timothy McVeigh. The blast and catastrophic collapse killed 168 people and injured over 680. The blast shock-wave destroyed or damaged 324 buildings within a 340-meter radius, destroyed or burned 86 cars, and shattered glass in 258 nearby buildings, causing at least an estimated $652 million worth of damage. McVeigh was convicted and subsequently executed by lethal injection on June 11, 2001. The Sonic Drive-In restaurant chain is headquartered in Oklahoma City. The economy of Oklahoma City, once just a regional power center of government and energy exploration, has since diversified to include the sectors of information technology, services, health services, and administration. The city is headquarters to two Fortune 500 companies: Chesapeake Energy and Devon Energy, as well as being home to Love's Travel Stops & Country Stores, which is ranked thirteenth on Forbes' list of private companies. Other major corporations with a large presence (over 1000 employees) in the city of Oklahoma City include Dell, The Hertz Corporation, United Parcel Service, Farmers Insurance Group, Great Plains Coca-Cola Bottling Company, Cox Communications, The Boeing Company, Deaconess Hospital, Johnson Controls, MidFirst Bank, American Fidelity Assurance, Rose State College, and Continental Resources. While not in the city limits, other large employers within the Oklahoma City MSA include United States Air Force – Tinker AFB (27,000); University of Oklahoma (11,900); University of Central Oklahoma (2,900); and Norman Regional Hospital (2,800). According to the Oklahoma City Chamber of Commerce, the metropolitan area's economic output grew by 33% between 2001 and 2005 due chiefly to economic diversification. Its gross metropolitan product (GMP) was $43.1 billion in 2005 and grew to $61.1 billion in 2009. By 2016 the GMP had grown to $73.8 billion. In 2008, Forbes magazine named Oklahoma City the most "recession proof city in America". The magazine reported that the city had falling unemployment, one of the strongest housing markets in the country and solid growth in energy, agriculture and manufacturing. However, during the early 1980s, Oklahoma City had one of the worst job and housing markets due to the bankruptcy of Penn Square Bank in 1982 and then the post-1985 crash in oil prices (oil bust). In 2013, Forbes ranked Oklahoma City at No. 8 on its list of the "Best Places for Business and Careers". In 2014, Forbes ranked the city at No. 7 on its list of "Best Places for Business". In 2017 and 2018, WalletHub ranked the city first on its list of "Best Large Cities to Start a Business". Business and entertainment districts (and to a lesser extent local neighborhoods) tend to maintain their boundaries and character through the application of zoning regulations and business improvement districts (districts where property owners agree to a property tax surcharge to support additional services for the community). Through zoning regulations, historic districts, and other special zoning districts, including overlay districts, are well established. Oklahoma City has three business improvement districts, including one encompassing the central business district. The Donald W. Reynolds Visual Arts Center is the new downtown home for the Oklahoma City Museum of Art. The museum features visiting exhibits, original selections from its own collection, a theater showing a variety of foreign, independent, and classic films each week, and a restaurant. OKCMOA is also home to the most comprehensive collection of Chihuly glass in the world including the 55-foot Eleanor Blake Kirkpatrick Memorial Tower in the Museum's atrium. The art deco Civic Center Music Hall, which was totally renovated in 2001, has performances from the Oklahoma City Ballet, the Oklahoma City Opera, the Oklahoma City Philharmonic and also various concerts and traveling Broadway shows. Other theaters include Lyric Theatre, Jewel Box Theatre, Kirkpatrick Auditorium, the Poteet Theatre, the Oklahoma City Community College Bruce Owen Theater and the 488-seat Petree Recital Hall, at the Oklahoma City University campus. The university also opened the Wanda L Bass School of Music and auditorium in April 2006. The Science Museum Oklahoma (formerly Kirkpatrick Science and Air Space Museum at Omniplex) houses exhibits on science, aviation, and an IMAX theater. The museum formerly housed the International Photography Hall of Fame (IPHF) that exhibits photographs and artifacts from a large collection of cameras and other artifacts preserving the history of photography. IPHF honors those who have made significant contributions to the art and/or science of photography and relocated to St. Louis, Missouri in 2013. The Museum of Osteology houses more than 300 real animal skeletons. Focusing on the form and function of the skeletal system, this 7,000 sq ft (650 m2) museum displays hundreds of skulls and skeletons from all corners of the world. Exhibits include adaptation, locomotion, classification and diversity of the vertebrate kingdom. The Museum of Osteology is the only one of its kind in America. The National Cowboy & Western Heritage Museum has galleries of western art and is home to the Hall of Great Western Performers. In contrast, the city will also be home to The American Indian Cultural Center and Museum that began construction in 2009 (although completion of the facility has been held up due to insufficient funding), on the south side of Interstate 40, southeast from Bricktown. The Oklahoma City National Memorial in the northern part of Oklahoma City's downtown was created as the inscription on its eastern gate of the Memorial reads, "to honor the victims, survivors, rescuers, and all who were changed forever on April 19, 1995"; the memorial was built on the land formerly occupied by the Alfred P. Murrah Federal Building complex prior to its 1995 bombing. The outdoor Symbolic Memorial can be visited 24 hours a day for free, and the adjacent Memorial Museum, in the former Journal Record building damaged by the bombing, can be entered for a small fee. The site is also home to the National Memorial Institute for the Prevention of Terrorism, a non-partisan, nonprofit think tank devoted to the prevention of terrorism. The American Banjo Museum in the Bricktown Entertainment district is dedicated to preserving and promoting the music and heritage of the banjo. Its collection is valued at $3.5 million, and an interpretive exhibit tells the evolution of the banjo from its roots in American slavery, to bluegrass, to folk and to world music. 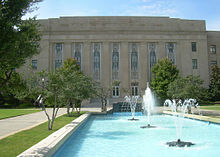 The Oklahoma History Center is the history museum of the state of Oklahoma. Across the street from the governor's mansion at 800 Nazih Zuhdi Drive in northeast Oklahoma City, the museum opened in 2005 and is operated by the Oklahoma Historical Society. It preserves the history of Oklahoma from the prehistoric to the present day. Oklahoma City is home to several professional sports teams, including the Oklahoma City Thunder of the National Basketball Association. The Thunder is the city's second "permanent" major professional sports franchise after the now-defunct AFL Oklahoma Wranglers and is the third major-league team to call the city home when considering the temporary hosting of the New Orleans/Oklahoma City Hornets for the 2005–06 and 2006–07 NBA seasons. Other professional sports clubs in Oklahoma City include the Oklahoma City Dodgers, the Triple-A affiliate of the Los Angeles Dodgers, the Oklahoma City Energy FC of the United Soccer League, and the Crusaders of Oklahoma Rugby Football Club of USA Rugby. The Oklahoma City Blazers, a name used for decades of the city's hockey team in the Central Hockey League has been used for a junior team in the Western States Hockey League since 2014. Chesapeake Energy Arena in downtown is the main multipurpose arena in the city which hosts concerts, NHL exhibition games, and many of the city's pro sports teams. In 2008, the Oklahoma City Thunder became the major tenant. 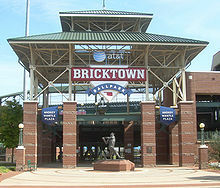 Nearby in Bricktown, the Chickasaw Bricktown Ballpark is the home to the city's baseball team, the Dodgers. "The Brick," as it is locally known, is considered one of the finest minor league parks in the nation. Oklahoma City is the annual host of the Big 12 Baseball Tournament, the World Cup of Softball, and the annual NCAA Women's College World Series. The city has held the 2005 NCAA Men's Basketball First and Second round and hosted the Big 12 Men's and Women's Basketball Tournaments in 2007 and 2009. The major universities in the area – University of Oklahoma, Oklahoma City University, and Oklahoma State University – often schedule major basketball games and other sporting events at Chesapeake Energy Arena and Chickasaw Bricktown Ballpark, although most home games are played at their campus stadiums. Other major sporting events include Thoroughbred and Quarter Horse racing circuits at Remington Park and numerous horse shows and equine events that take place at the state fairgrounds each year. There are numerous golf courses and country clubs spread around the city. The state of Oklahoma hosts a highly competitive high school football culture, with many teams in the Oklahoma City metropolitan area. The Oklahoma Secondary School Activities Association (OSSAA) organizes high school football into eight distinct classes based on the size of school enrollment. Beginning with the largest, the classes are: 6A, 5A, 4A, 3A, 2A, A, B, and C. Class 6A is broken into two divisions. Oklahoma City area schools in this division include Edmond Memorial, Mustang, Moore, Yukon, Edmond North, Edmond Santa Fe, Norman North, Westmoore, Southmoore, Putnam City North, Norman, Putnam City, Putnam City West, U.S. Grant, and Midwest City. The Oklahoma City Thunder of the National Basketball Association (NBA) has called Oklahoma City home since the 2008–09 season, when owner Clay Bennett relocated the franchise from Seattle, Washington. The Thunder play home games at the Chesapeake Energy Arena in downtown Oklahoma City, known affectionately in the national media as 'the Peake' and 'Loud City'. The Thunder is known by several nicknames, including "OKC Thunder" and simply "OKC," and its mascot is Rumble the Bison. After an arrival to Oklahoma City for the 2008–09 season, the Oklahoma City Thunder secured a berth (8th) in the 2010 NBA Playoffs the next year after boasting its first 50-win season, winning two games in the first round against the Los Angeles Lakers. In 2012, Oklahoma City made it to the NBA Finals, but lost to the Miami Heat in five games. In 2013 the Thunder reached the Western Conference semi-finals without All-Star guard Russell Westbrook, who was injured in their first round series against the Houston Rockets, only to lose to the Memphis Grizzlies. In 2014 Oklahoma City again reached the NBA's Western Conference Finals but eventually lost to the San Antonio Spurs in six games. The Oklahoma City Thunder has been regarded by sports analysts as one of the elite franchises of the NBA's Western Conference and that of a media darling as the future of the league. Oklahoma City earned Northwest Division titles every year from 2011 to 2014, and again in 2016, and has consistently improved its win record to 59-wins in 2014. The Thunder is led by third year head coach Billy Donovan and is anchored by All-Star point guard Russell Westbrook. In the aftermath of Hurricane Katrina, the NBA's New Orleans Hornets temporarily relocated to the Ford Center, playing the majority of its home games there during the 2005–06 and 2006–07 seasons. The team became the first NBA franchise to play regular-season games in the state of Oklahoma. The team was known as the New Orleans/Oklahoma City Hornets while playing in Oklahoma City. The team ultimately returned to New Orleans full-time for the 2007–08 season. The Hornets played their final home game in Oklahoma City during the exhibition season on October 9, 2007 against the Houston Rockets. 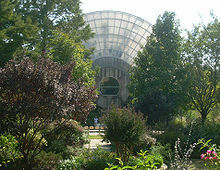 One of the more prominent landmarks downtown is the Crystal Bridge at the Myriad Botanical Gardens, a large downtown urban park. Designed by I. M. Pei, the Crystal Bridge is a tropical conservatory in the area. The park has an amphitheater, known as the Water Stage. In 2007, following a renovation of the stage, Oklahoma Shakespeare in the Park relocated to the Myriad Gardens. The Myriad Gardens will undergo a massive renovation in conjunction with the recently built Devon Tower directly north of it. The Oklahoma City Zoo and Botanical Garden is home to numerous natural habitats, WPA era architecture and landscaping, and hosts major touring concerts during the summer at its amphitheater. Oklahoma City also has two amusement parks, Frontier City theme park and White Water Bay water park. Frontier City is an 'Old West'-themed amusement park. The park also features a recreation of a western gunfight at the 'OK Corral' and many shops that line the "Western" town's main street. Frontier City also hosts a national concert circuit at its amphitheater during the summer. Oklahoma City also has a combination racetrack and casino open year-round, Remington Park, which hosts both Quarter Horse (March – June) and Thoroughbred (August – December) seasons. In April 2005, the Oklahoma City Skate Park at Wiley Post Park was renamed the Mat Hoffman Action Sports Park to recognize Mat Hoffman, an Oklahoma City area resident and businessman that was instrumental in the design of the skate park and is a 10-time BMX World Vert champion. In March 2009, the Mat Hoffman Action Sports Park was named by the National Geographic Society Travel Guide as one of the "Ten Best." The City of Oklahoma City has operated under a council-manager form of city government since 1927. David Holt assumed the office of Mayor on April 10, 2018 after being elected two months earlier. Eight councilpersons represent each of the eight wards of Oklahoma City. The City Council appointed current City Manager Craig Freeman on November 20, 2018. Freeman took office on January 2, 2018, succeeding James D. Couch, who had served in the role since 2000. Prior to becoming City Manager, Craig Freeman served as Finance Director for the city. Similar to many American cities, Oklahoma City is politically conservative in its suburbs, and liberal in the central city. The city has called on residents to vote for sales tax-based projects to revitalize parts of the city. The Bricktown district is the best example of such an initiative. In the recent MAPS 3 vote, the city's fraternal order of police criticized the project proposals for not doing enough to expand the police presence to keep up with the growing residential population and increased commercial activity. In September 2013, Oklahoma City area attorney David Slane announced he would pursue legal action regarding MAPS3, on claims the multiple projects that made up the plan violate a state constitutional law limiting voter ballot issues to a single subject. Oklahoma City region population dot map and 2016 Presidential election results by precinct (click to enlarge). The city is home to several colleges and universities. Oklahoma City University, formerly known as Epworth University, was founded by the United Methodist Church on September 1, 1904 and is known for its performing arts, science, mass communications, business, law, and athletic programs. OCU has its main campus in the north-central section of the city, near the city's Chinatown area. OCU Law is in the Midtown district near downtown, in the old Central High School building. The third-largest university in the state, the University of Central Oklahoma, is just north of the city in the suburb of Edmond. Oklahoma Christian University, one of the state's private liberal arts institutions, is just south of the Edmond border, inside the Oklahoma City limits. Oklahoma City Community College in south Oklahoma City is the second-largest community college in the state. Rose State College is east of Oklahoma City in suburban Midwest City. Oklahoma State University–Oklahoma City is in the "Furniture District" on the Westside. Northeast of the city is Langston University, the state's historically black college (HBCU). Langston also has an urban campus in the eastside section of the city. Southern Nazarene University, which was founded by the Church of the Nazarene, is a university in suburban Bethany, which is surrounded by the Oklahoma City city limits. Although technically not a university, the FAA's Mike Monroney Aeronautical Center has many aspects of an institution of higher learning. Its FAA Academy is accredited by the Higher Learning Commission. Its Civil Aerospace Medical Institute (CAMI) has a medical education division responsible for aeromedical education in general as well as the education of aviation medical examiners in the U.S. and 93 other countries. In addition, The National Academy of Science offers Research Associateship Programs for fellowship and other grants for CAMI research. Oklahoma City is home to the state's largest school district, Oklahoma City Public Schools. The district's Classen School of Advanced Studies and Harding Charter Preparatory High School rank high among public schools nationally according to a formula that looks at the number of Advanced Placement, International Baccalaureate and/or Cambridge tests taken by the school's students divided by the number of graduating seniors. In addition, OKCPS's Belle Isle Enterprise Middle School was named the top middle school in the state according to the Academic Performance Index, and recently received the Blue Ribbon School Award, in 2004 and again in 2011. KIPP Reach College Preparatory School in Oklahoma City received the 2012 National Blue Ribbon along with its school leader, Tracy McDaniel Sr., being awarded the Terrel H. Bell Award for Outstanding Leadership. The Oklahoma School of Science and Mathematics, a school for some of the state's most gifted math and science pupils, is also in Oklahoma City. Due to Oklahoma City's explosive growth, parts of several suburban districts spill into the city, including Putnam City School District in the northwest, Moore Public Schools in the south, and Mid-Del School District in the southeast. The city also boasts a number of private and parochial schools. Casady School and Heritage Hall School are both examples of a private college preparatory school with vigorous academics that range among the top in Oklahoma. Providence Hall is a Protestant school. Two prominent schools of the Archdiocese of Oklahoma City include Bishop McGuinness High School and Mount Saint Mary High School. Other private schools include the Advanced Science and Technology Education Center and Crossings Christian School. Private career and technology education schools in Oklahoma City include Oklahoma Technology Institute, Platt College, Vatterott College, and Heritage College. The Dale Rogers Training Center in Oklahoma City is a nonprofit vocational training center for individuals with disabilities. The Oklahoman is Oklahoma City's major daily newspaper and is the most widely circulated in the state. NewsOK.com is the Oklahoman's online presence. Oklahoma Gazette is Oklahoma City's independent newsweekly, featuring such staples as local commentary, feature stories, restaurant reviews and movie listings and music and entertainment. The Journal Record is the city's daily business newspaper, and okcBIZ is a monthly publication that covers business news affecting those who live and work in Central Oklahoma. Numerous community and international newspapers cater to the city's ethnic mosaic, such as The Black Chronicle, headquartered in the Eastside, the OK VIETIMES and Oklahoma Chinese Times, in Asia District, and various Hispanic community publications. The Campus is the student newspaper at Oklahoma City University. Gay publications include The Gayly Oklahoman. An upscale lifestyle publication called Slice Magazine is circulated throughout the metropolitan area. In addition, there is a magazine published by Back40 Design Group called The Edmond Outlook. It contains local commentary and human interest pieces direct-mailed to over 50,000 Edmond residents. Oklahoma City was home to several pioneers in radio and television broadcasting. Oklahoma City's WKY Radio was the first radio station transmitting west of the Mississippi River and the third radio station in the United States. WKY received its federal license in 1921 and has continually broadcast under the same call letters since 1922. In 1928, WKY was purchased by E.K. Gaylord's Oklahoma Publishing Company and affiliated with the NBC Red Network; in 1949, WKY-TV (channel 4) went on the air and later became the first independently owned television station in the U.S. to broadcast in color. In mid-2002, WKY radio was purchased outright by Citadel Broadcasting, who was bought out by Cumulus Broadcasting in 2011. The Gaylord family earlier sold WKY-TV in 1976, which has gone through a succession of owners (what is now KFOR-TV is owned by Tribune Broadcasting as of December 2013). The major U.S. broadcast television networks have affiliates in the Oklahoma City market (ranked 41st for television by Nielsen and 48th for radio by Arbitron, covering a 34-county area serving the central, north-central and west-central sections of Oklahoma); including NBC affiliate KFOR-TV (channel 4), ABC affiliate KOCO-TV (channel 5), CBS affiliate KWTV-DT (channel 9, the flagship of locally based Griffin Communications), PBS station KETA-TV (channel 13, the flagship of the state-run OETA member network), Fox affiliate KOKH-TV (channel 25), CW affiliate KOCB (channel 34), independent station KAUT-TV (channel 43), MyNetworkTV affiliate KSBI-TV (channel 52), and Ion Television owned-and-operated station KOPX-TV (channel 62). The market is also home to several religious stations including TBN owned-and-operated station KTBO-TV (channel 14) and Norman-based Daystar owned-and-operated station KOCM (channel 46). Despite the market's geographical size, none of the English-language commercial affiliates in the Oklahoma City designated market area operate full-power satellite stations covering the far northwestern part of the state (requiring cable or satellite to view them), though KFOR-TV, KOCO-TV, KWTV-DT and KOKH-TV each operate low-power translators in that portion of the market. Oklahoma City is one of the few markets between Chicago and Dallas to have affiliates of two or more of the major Spanish-language broadcast networks: Telemundo affiliate KTUZ-TV (channel 30), Woodward-based Univision affiliate KUOK 35 (whose translator KUOK-CD, channel 36, serves the immediate Oklahoma City area), Azteca affiliate KOHC-CD (channel 45) and Estrella TV affiliate KOCY-LP (channel 48). Oklahoma City is protected by the Oklahoma City Fire Department (OKCFD), which employs 1015 paid, professional firefighters. The current Chief of Department is Richard Kelley, the department is also commanded by three Deputy Chiefs, who – along with the department chief – oversee the Operational Services, Prevention Services, and Support Services bureaus. The OKCFD operates out of 37 fire stations throughout the city in six battalions. The OKCFD also operates a fire apparatus fleet of 36 engines (including 30 paramedic engines), 13 ladders, 16 brush patrol units, six water tankers, two hazardous materials units, one Technical Rescue Unit, one Air Supply Unit, six Arson Investigation Units, and one Rehabilitation Unit. Each engine is staffed with a driver, an officer, and one to two firefighters, while each ladder company is staffed with a driver, an officer, and one firefighter. Minimum staffing per shift is 213 personnel. The Oklahoma City Fire Department responds to over 70,000 emergency calls annually. Oklahoma City is an integral point on the United States Interstate Network, with three major interstate highways – Interstate 35, Interstate 40, and Interstate 44 – bisecting the city. Interstate 240 connects Interstate 40 and Interstate 44 in south Oklahoma City, while Interstate 235 spurs from Interstate 44 in north-central Oklahoma City into downtown. Major state expressways through the city include Lake Hefner Parkway (SH-74), the Kilpatrick Turnpike, Airport Road (SH-152), and Broadway Extension (US-77) which continues from I-235 connecting Central Oklahoma City to Edmond. Lake Hefner Parkway runs through northwest Oklahoma City, while Airport Road runs through southwest Oklahoma City and leads to Will Rogers World Airport. The Kilpatrick Turnpike loops around north and west Oklahoma City. Oklahoma City also has several major national and state highways within its city limits. Shields Boulevard (US-77) continues from E.K. Gaylord Boulevard in downtown Oklahoma City and runs south eventually connecting to I-35 near the suburb of Moore, Oklahoma. Northwest Expressway (Oklahoma State Highway 3) runs from North Classen Boulevard in north-central Oklahoma City to the northwestern suburbs. 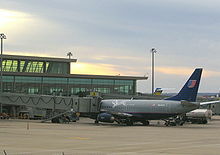 Oklahoma City is served by two primary airports, Will Rogers World Airport and the much smaller Wiley Post Airport (incidentally, the two honorees died in the same plane crash in Alaska) Will Rogers World Airport is the state's busiest commercial airport, with just under 4 million passengers served in 2017, a historic record. Tinker Air Force Base, in southeast Oklahoma City, is the largest military air depot in the nation; a major maintenance and deployment facility for the Navy and the Air Force, and the second largest military institution in the state (after Fort Sill in Lawton). Amtrak has a station downtown at the Santa Fe Depot, with daily service to Fort Worth and the nation's rail network via the Heartland Flyer. Oklahoma City once was the crossroads of several interstate passenger railroads, at the Santa Fe Depot, the Union Station and at the station of the Missouri-Kansas-Texas Railroad. But service at that level has long since been discontinued. Freight service is provided by BNSF and Union Pacific. Embark (formerly Metro Transit) is the city's public transit company. The main transfer terminal is downtown at NW 5th Street and Hudson Avenue. Embark maintains limited coverage of the city's main street grid using a hub-and-spoke system from the main terminal, making many journeys impractical due to the rather small number of bus routes offered and that most trips require a transfer downtown. The city has recognized transit as a major issue for the rapidly growing and urbanizing city and has initiated several studies in recent times to improve upon the existing bus system starting with a plan known as the Fixed Guideway Study. This study identified several potential commuter transit routes from the suburbs into downtown OKC as well as feeder-line bus and/or rail routes throughout the city. Though Oklahoma City has no light rail or commuter rail service, city residents identified improved transit as one of their top priorities, and from the fruits of the Fixed Guideway and other studies city leaders strongly desire to incorporate urban rail transit into the region's future transportation plans. The greater Oklahoma City metropolitan transit plan identified from the Fixed Guideway Study includes a streetcar system in the downtown area, to be fed by enhanced city bus service and commuter rail from the suburbs including Edmond, Norman, and Midwest City. There is a significant push for a commuter rail line connecting downtown OKC with the eastern suburbs of Del City, Midwest City, and Tinker Air Force Base. In addition to commuter rail, a short heritage rail line that would run from Bricktown just a few blocks away from the Amtrak station to the Adventure District in northeast Oklahoma City is under reconstruction. In December 2009, Oklahoma City voters passed MAPS 3, the $777 million (7-year, 1-cent tax) initiative, which would generate funding (approx. $130 million) for the modern Oklahoma City Streetcar system in downtown Oklahoma City and the establishment of a transit hub. On September 10, 2013, the federal government announced that Oklahoma City would receive a $13.8-million grant from the U.S. Department of Transportation's TIGER program. This was the first-ever grant for Oklahoma City for a rail-based initiative and is thought to be somewhat of a turning point by city leaders who have applied for grants in the past, only to continuously be denied. It is believed the city will use the TIGER grant along with approximately $10 million from the MAPS 3 Transit budget to revitalize the city's Amtrak station becoming an Intermodal Transportation Hub, taking over the role of the existing transit hub at NW 5th/Hudson Ave.
Construction of the Oklahoma City Streetcar system in Downtown OKC began in early 2017, and the system opened for service in December 2018. Also known as the Maps 3 Streetcar, it connects the areas of Bricktownn, Midtown and Downtown. The 6.9 mi (11.1 km) system serves the greater Downtown area using modern, low-floor streetcars. 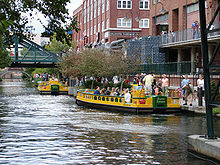 The initial system consists of two lines that connecting Oklahoma City's Central Business District with the entertainment district, Bricktown, and the Midtown District. Expansion to other districts surrounding downtown as well as more routes in the CBD is already underway. A 2013 study by Walk Score ranked Oklahoma City the forty-third most walkable out of the 50 largest U.S. cities. However, this number is misleading because of Oklahoma City's very large geographic size, which is far larger than cities like New York City and Los Angeles and includes large areas which are effectively though not officially suburbs of the city core. 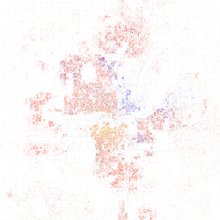 Oklahoma City has 18 neighborhoods with a Walk Score above 60, mainly close to the downtown core. Oklahoma City and the surrounding metropolitan area are home to a number of health care facilities and specialty hospitals. In Oklahoma City's MidTown district near downtown resides the state's oldest and largest single site hospital, St. Anthony Hospital and Physicians Medical Center. OU Medicine, an academic medical institution on the campus of The University of Oklahoma Health Sciences Center, is home to OU Medical Center. OU Medicine operates Oklahoma's only level-one trauma center at the OU Medical Center and the state's only level-one trauma center for children at Children's Hospital at OU Medicine, both of which are in the Oklahoma Health Center district. Other medical facilities operated by OU Medicine include OU Physicians and OU Children's Physicians, the OU College of Medicine, the Oklahoma Cancer Center and OU Medical Center Edmond, the latter in the northern suburb of Edmond. INTEGRIS Health owns several hospitals, including INTEGRIS Baptist Medical Center, the INTEGRIS Cancer Institute of Oklahoma, and the INTEGRIS Southwest Medical Center. INTEGRIS Health operates hospitals, rehabilitation centers, physician clinics, mental health facilities, independent living centers and home health agencies hroughout much of Oklahoma. INTEGRIS Baptist Medical Center was named in U.S. News & World Report's 2012 list of Best Hospitals. INTEGRIS Baptist Medical Center ranks high-performing in the following categories: Cardiology and Heart Surgery; Diabetes and Endocrinology; Ear, Nose and Throat; Gastroenterology; Geriatrics; Nephrology; Orthopedics; Pulmonology and Urology. The Midwest Regional Medical Center is in the suburb of Midwest City; other major hospitals in the city include the Oklahoma Heart Hospital and the Mercy Health Center. There are 347 physicians for every 100,000 people in the city. In the American College of Sports Medicine's annual ranking of the United States' 50 most populous metropolitan areas on the basis of community health, Oklahoma City took last place in 2010, falling five places from its 2009 rank of 45. The ACSM's report, published as part of its American Fitness Index program, cited, among other things, the poor diet of residents, low levels of physical fitness, higher incidences of obesity, diabetes, and cardiovascular disease than the national average, low access to recreational facilities like swimming pools and baseball diamonds, the paucity of parks and low investment by the city in their development, the high percentage of households below the poverty level, and the lack of state-mandated physical education curriculum as contributing factors. ^ Lackmeyer, Steve (April 21, 2010). "'Big Friendly' moniker is beginning to stick". The Oklahoman. Retrieved September 10, 2018. ^ a b "Oklahoma City". Oklahoma History Society. Archived from the original on April 12, 2016. Retrieved April 12, 2016. ^ "American FactFinder". United States Census Bureau. Retrieved August 29, 2014. ^ "Zip Code Lookup". USPS. Archived from the original on November 23, 2010. Retrieved December 11, 2008. ^ "Tornadoes Which Have Occurred in the Oklahoma City, Oklahoma Area Since 1890". National Weather Service Norman Oklahoma. Retrieved December 8, 2015. ^ Wilson, Linda D. "Oklahoma City Archived March 18, 2011, at WebCite," Encyclopedia of Oklahoma History and Culture Archived February 1, 2015, at the Wayback Machine. Retrieved January 26, 2010. ^ Curtis, Gene. "Only in Oklahoma: State capital location was a fight to the finish", Tulsa World. Retrieved February 4, 2010. ^ a b Dean, Bryan (December 28, 2012). "Former Oklahoma City Mayor Patience Latting dies at age 94". The Oklahoman. Retrieved January 11, 2013. ^ "Criterion Group". OKCHistory.com. Archived from the original on October 7, 2011. Retrieved October 20, 2009. ^ "The Criterion Group, main page". The Criterion Group. Archived from the original on October 29, 2009. Retrieved October 20, 2009. ^ "Baum Building". OKCHistory.org. Archived from the original on July 7, 2009. Retrieved October 20, 2009. ^ "Hales Building". OKCHistory.org. Archived from the original on July 7, 2009. Retrieved October 21, 2009. ^ Lackmeyer and Money, pp. 20, 42. ^ "Biltmore Hotel". OKCHistory.org. Archived from the original on July 25, 2009. Retrieved October 20, 2009. ^ Metropolitan Area Projects, Greater Oklahoma City Chamber. Retrieved February 5, 2010. ^ "Victims of the Oklahoma City bombing". USA Today. Associated Press. June 20, 2001. Archived from the original on February 27, 2011. ^ "Core to Shore at City of Oklahoma City". okc.gov. Archived from the original on May 27, 2010. ^ "About Oklahoma City". okc.gov. Archived from the original on February 23, 2016. Retrieved February 25, 2016. ^ Oklahoma Geography, NetState.com . Retrieved February 4, 2010. ^ "Ecoregions of Oklahoma" (PDF). Retrieved September 24, 2008. ^ History of the Oklahoma City Zoo Archived January 17, 2016, at the Wayback Machine, Oklahoma City Life Web site. Retrieved February 5, 2010. ^ Elmias Thomas Collection Projects Series Archived November 15, 2014, at the Wayback Machine, University of Oklahoma. Retrieved February 5, 2010. ^ About, Modern Transit Project. Retrieved February 5, 2010. ^ "Devon Tower". Emporis Corporation. Retrieved December 2, 2011. ^ "Chase Tower". Emporis Corporation. Retrieved March 16, 2010. ^ "First National Center". Emporis Corporation. Retrieved March 16, 2010. ^ "City Place". Emporis Corporation. Retrieved March 16, 2010. ^ "Oklahoma Tower". Emporis Corporation. Retrieved March 16, 2010. ^ "BOK Park Plaza". Emporis Corporation. Retrieved October 9, 2017. ^ "Sandridge Center". Emporis Corporation. Retrieved March 16, 2010. ^ "Valliance Bank Tower". Emporis Corporation. Retrieved March 16, 2010. ^ "Bank of Oklahoma Plaza". Emporis Corporation. Retrieved March 16, 2010. 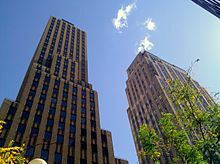 ^ "AT&T Building". Emporis Corporation. Retrieved March 14, 2012. ^ "Leadership Square North Tower". Emporis Corporation. Retrieved March 16, 2010. ^ "Climatological averages and records" NWS Norman, Oklahoma. Retrieved August 22, 2012. ^ a b c "NowData - NOAA Online Weather Data". National Oceanic and Atmospheric Administration. Retrieved October 18, 2018. ^ NOAA (2013). "Regional Climate Trends and Scenarios for the U.S. National Climate Assessment" (PDF). p. 58. ^ "The Great Plains Tornado Outbreak of May 3–4, 1999". National Weather Service Norman Oklahoma. Retrieved May 30, 2013. ^ "The Tornado Outbreak of May 20, 2013". National Weather Service Norman, Oklahoma. 2013. Retrieved May 30, 2013. ^ "The May 31 – June 1, 2013 Tornado and Flash Flooding Event". National Weather Service Norman, Oklahoma. 2013. Retrieved June 10, 2013. ^ "After massive storms in Oklahoma and Texas, at least nine killed and 30 people missing". Washington Post. May 26, 2015. ^ "Station Name: OK OKLAHOMA CITY WILL ROGERS AP". National Oceanic and Atmospheric Administration. Retrieved March 10, 2013. ^ "WMO Climate Normals for OKLAHOMA CITY/WSFO AP OK 1961–1990". National Oceanic and Atmospheric Administration. Retrieved March 11, 2014. ^ "Oklahoma City, Oklahoma, USA – Monthly weather forecast and Climate data". Weather Atlas. Retrieved January 28, 2019. ^ United States Census Bureau. "Census of Population and Housing". Archived from the original on May 12, 2015. Retrieved June 8, 2015. ^ Data Access and Dissemination Systems (DADS). "American FactFinder – Results". census.gov. Archived from the original on March 5, 2014. ^ "Oklahoma City, Oklahoma (OK) income, earnings, and wages data". City-data.com. Retrieved March 29, 2013. ^ "Oklahoma City (city) QuickFacts from the US Census Bureau". Quickfacts.census.gov. Archived from the original on March 28, 2009. Retrieved March 29, 2013. 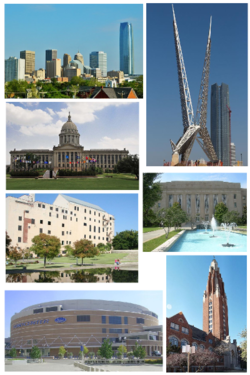 ^ "State & County QuickFacts – Oklahoma City (city), Oklahoma". United States Census Bureau. Archived from the original on March 28, 2009. ^ "Narcotics agents arrest suspected cartel member in Oklahoma City". Newsok.com. June 29, 2010. Retrieved February 15, 2012. ^ Stover, Jean (2009). Sirloin Stockade Slaughter: Murder on the Run. Durham, Connecticut: Eloquent Books. ISBN 978-1-60860-924-6. ^ "Fortune 500 2014:Chesapeake Energy Corporation". Forbes. Archived from the original on October 25, 2014. Retrieved November 29, 2014. ^ "Fortune 500 2014:Devon Energy Corporation". Forbes. Archived from the original on November 29, 2014. Retrieved November 29, 2014. ^ "Love's Travel Stops & Country Stores". Forbes. October 2014. Archived from the original on October 19, 2014. Retrieved November 29, 2014. ^ a b c "Oklahoma City MSA Major Employer List". Greater Oklahoma City. July 2014. Archived from the original on November 29, 2014. Retrieved November 29, 2014. ^ "Oklahoma City: Economy, City-Data.com. . Retrieved January 26, 2010. ^ Zumbrun, Joshua (April 29, 2008). "America's Recession-Proof Cities". Forbes. ^ "Best Places For Business and Careers – Forbes". Forbes. Retrieved January 14, 2014. ^ "Best Places – No. 7 Oklahoma City, Okla. – In Photos: Best And Worst Places For Business 2014". Forbes. Retrieved October 20, 2015. ^ "2017's Best Large Cities to Start a Business". WalletHub. Retrieved May 5, 2017. ^ "Business Improvement Districts". The City of Oklahoma City. Archived from the original on December 18, 2014. Retrieved November 29, 2014. ^ "Special Zoning District Map" (PDF). City of Oklahoma City. Archived from the original (PDF) on December 18, 2014. Retrieved November 29, 2014. ^ Couch, James D. "Council Agenda Item No. VIII. I. April 26, 2005" (PDF). Memorandum. The City of Oklahoma City. Archived from the original (PDF) on October 29, 2013. Retrieved July 23, 2012. ^ Magasmen, Susan (2009). The 10 Best of Everything Families: An Ultimate Guide For Families. Washington, D.C.: National Geographic. pp. 174–175. ISBN 978-1-4262-0394-7. ^ "OKC Skatepark named one of "Ten Best" in National Geographic Travel Guide". News. The City of Oklahoma City. Archived from the original on May 16, 2012. Retrieved July 23, 2012. ^ "Mayor and Council Archived February 1, 2015, at the Wayback Machine," City of Oklahoma City. Retrieved January 27, 2010. ^ "About Mayor Holt". City of Oklahoma City. April 10, 2018. Retrieved April 10, 2018. ^ "Craig Freeman sworn in as Oklahoma City Manager. News Releases | City of OKC". www.okc.gov. January 2, 2019. Retrieved January 16, 2019. ^ Oklahoma City responds to David Slane's challenge of MAPS-3, KOKH-TV, September 3, 2013. ^ "Dave Leip's Atlas of U.S. Presidential Elections". Retrieved June 11, 2011. ^ "Guatemala opens consulate in Oklahoma to serve growing population". The Oklahoman. June 20, 2017. ^ a b Oklahoma Fast Facts and Trivia. Retrieved January 26, 2009. ^ City of Oklahoma City | Fire Department. Okc.gov. Retrieved on July 21, 2013. ^ City of Oklahoma City | Fire Department Archived May 26, 2013, at the Wayback Machine. Okc.gov. Retrieved on July 21, 2013. ^ "Wiley Post Archived October 8, 2012, at the Wayback Machine," U.S. Centennial of Flight Commission. Retrieved February 1, 2010. ^ Current Statistics, Will Rogers World Airport . Retrieved January 12, 2018. ^ Crum, William (February 8, 2017). "Streetcar work begins in Bricktown". The Oklahoman. Retrieved February 8, 2017. ^ Crum, William (December 14, 2018). "Lines form to catch first rides on the Oklahoma City streetcar". The Oklahoman. GateHouse Media Inc. Retrieved December 14, 2018. ^ "OKC Streetcar service begins" (Press release). City of Oklahoma City. December 14, 2018. Retrieved December 14, 2018. ^ "Trauma Centers". American College of Surgeons. ^ INTEGRIS Cancer Institute of Oklahoma. ^ Stogner, Todd. "Oklahoma Hospital, Health Center & Clinic Locations – INTEGRIS OK". integrisok.com. ^ Best Places to Live in Oklahoma City, Oklahoma – Health (Retrieved May 6, 2010). ^ "ACSM American Fitness Index Ranks 50 Largest Metro Areas on Health And Community Fitness". 2009. Archived from the original on July 5, 2010. Retrieved May 26, 2010. ^ "Oklahoma City, OK MSA 2010 AFI Report" (PDF). Archived from the original (PDF) on August 15, 2011. Retrieved May 26, 2010. Wikimedia Commons has media related to Oklahoma City.